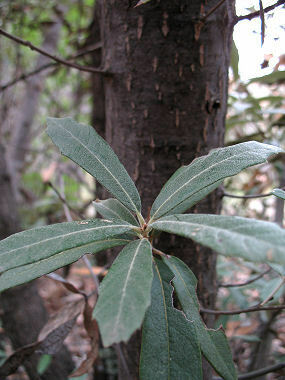 Silverleaf Oak is a member of the Beech Family. It can grow to 60 feet in height and 2.5 feet in diameter. It has blackish bark that becomes deeply furrowed as the tree ages. 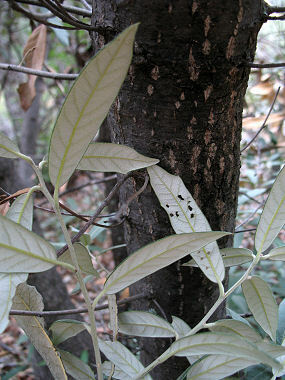 Leaves are green and shiny above and silvery beneath. They are lance-shaped grow to 4 inches in length. The tree grows in southern Arizona on mountain slopes and in canyons in oak woodlands at elevations between 5000-7000 feet. The acorn of the Silverleaf Oak takes between 1 to 2 years to mature. Silverleaf Oak blooms between April and May and produces tiny flowers that grow in drooping clusters on male trees and in short spikes on females. Flowers are followed by an acord which grows to 5.8 inches in length.